As part of an interdisciplinary team examining ways to reduce food waste in Maine, a researcher in the UMaine School of Economics and his undergraduate student assistant were recently awarded $17,000 from the Maine Department of Environmental Protection (DEP) towards a start-up composting program in the MidCoast region. The funds will go to project partners Bó Lait Farm of Washington, Maine and ScrapDogs Community Compost of Camden, Maine to implement a food scrap collection and processing system in the region. Researcher Travis Blackmer and undergraduate Taylor Patterson are part of a project called “Making Maine’s local food system sustainable” being conducted by a team of researchers and students affiliated with the Mitchell Center. Patterson is one of five undergraduate scholars being funded by the Diana Davis Spencer Foundation to conduct the research. 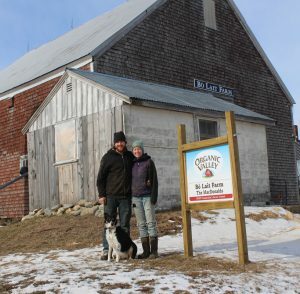 Connor and Alexis MacDonald of Bó Lait Farm in Washington, Maine. The DEP grant is being used to purchase hauling equipment, large 32-gallon toters and a trailer for ScrapDogs, and a new gravel composting pad and composting equipment where Bó Lait can process the food scraps and manure to begin the composting cooking process. 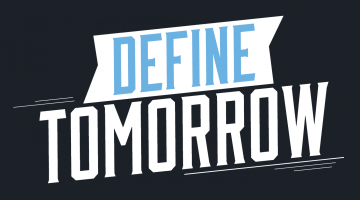 The team worked closely with DEP and the Maine Department of Agriculture to locate the Washington dairy farm run by Connor and Alexis MacDonald, who were anxious to join ranks in a startup composting business. ScrapDogs, the waste collector, hauler, and processor, came on board in July and focuses on households, restaurants, and other small food waste producers. Tessa Rosenberry and Davis Saltonstall of ScrapDogs were met with enthusiasm by their community and quickly have outgrown their pilot site in downtown Camden. Bó Lait will be on the compost production side given their access to the cow manure needed to mix with the food waste, the space at their farm, and because they have the tractors and other equipment needed to produce high-quality compost. “I like to call this the ‘MidCoast Composting Cooperative’—two companies that are separate but are partners,” says Blackmer, who is one of a handful of researchers on the Mitchell Center’s Materials Management team.